Man, this stuff is great!!! Welcome to ED'S RED web site! 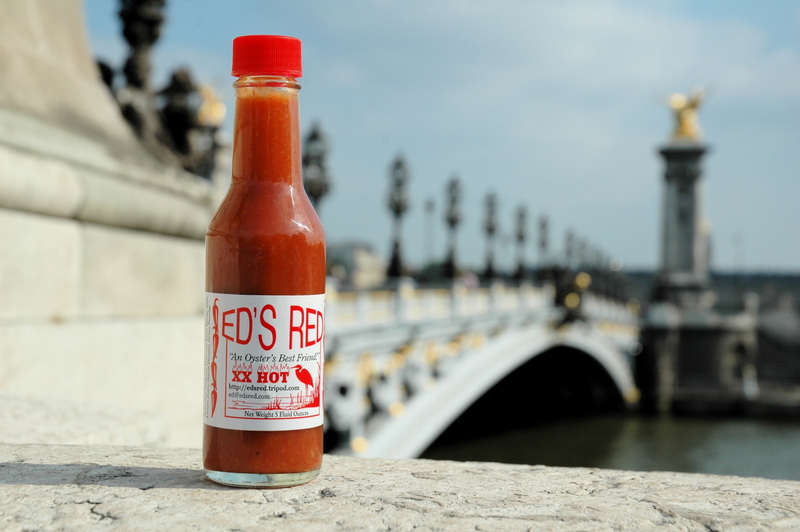 Ed's Red Goes To Paris!!! Oh LaLa!! "I told ya I'd ship it anywhere in the world!" This is my kitchen where it all began! A dream come true for Ed Creamer. A true Gulf county native. His roots are anchored deep in the Seafood Industry. 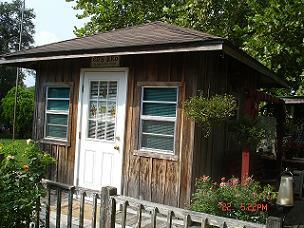 His dad, Dan, was a commercial fisherman and his mother, Mary, and his sister, Alice, shucked oysters. 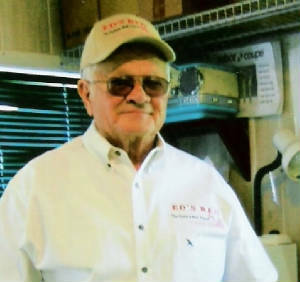 He grew up in Indian Pass and seafood was and still is his passion. As a young man, he joined the Navy to see the world. In his travels he tried hot sauces in every port, but nothing really satisfied him. 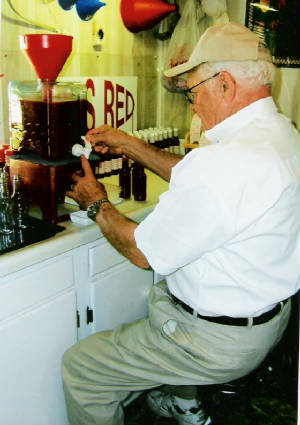 When he, his wife Dot, and young son Eddie returned to Port St. Joe, he began to experiment, recalling different sauces he had tried, and working on his own special taste. He used his family and friends as taste testers. 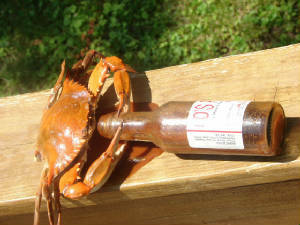 When he got the results he wanted, he took some bottles to Indian Pass Raw Bar to see how the customers would like it. He got an outstanding reception! Now he needed a name for his product. 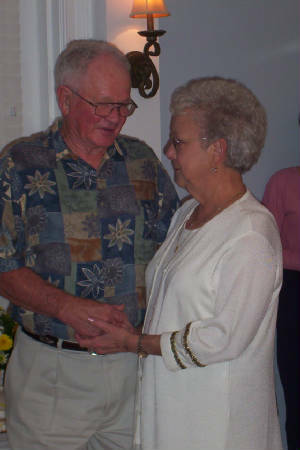 His wife, Dot settled that and named it ED'S RED. His son, Eddie designed the label and came up with the slogan, An Oyster's Best Friend! Ed designed and built a mixing kitchen and went to work. 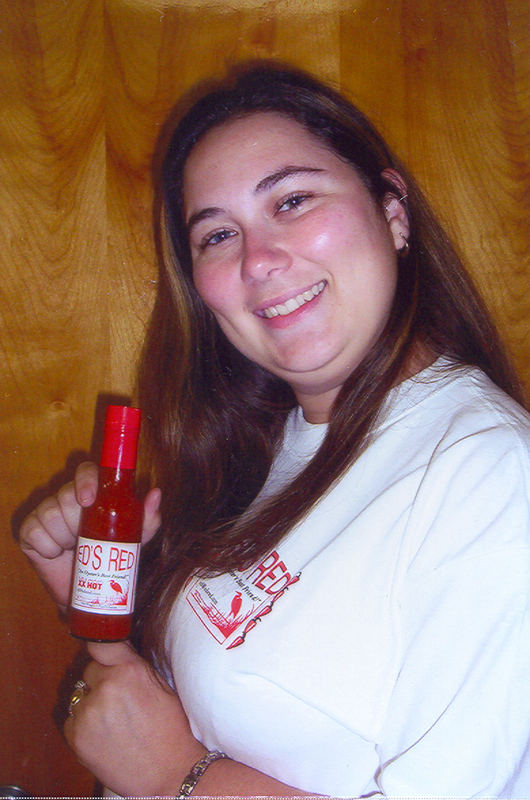 ED'S RED is in stores and restaurants locally from Panacea to Panama city Beach and from Port St. Joe to Blountstown. 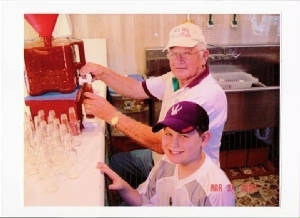 He has shipped to almost every state in the U.S.
Ed Creamer packaging his famouse ED'S RED! 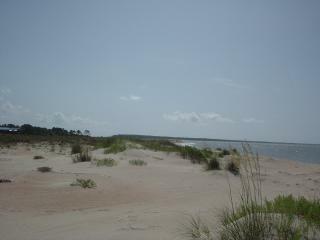 Florida between Panama city and Apalachicola. The following excert was published in Gray's Sporting Journal by local writer A.D. Livingston. Three cheers for ED'S RED! There is a new sauce with a more sharply defined purpose, or at least an uncluttered niche, released by a fellow named Ed Creamer of Port St. Joe, Florida. Billed on the label as "An Oyster's Best Friend", the sauce has roots that reach deep into the raw-bar tradition along the North Florida Gulf coast and for a hundred miles inland. Hereabouts, most of the oyster-vending establishments have long had their own house sauces, sometimes available in two or three heat scales. Mostly these are unlabeled homebrewed sauces. It seems to me that Creamer's new ED'S RED is the only commercial sauce to have developed this tradtition, more or less putting it all together while at the same time achieving something distinctive. In addition to the usual red chili pepper and vinegar, Creamer was wise enough to add a little lemon juice along with a touch of horseradish and tomato paste. It's the lemon that sets ED'S RED apart from the rest, I think. In any case the sauce is put up in five-ounce bottles, with a small hole in the tip for shaking out a drip or two at a time. It's not as hot as a typical Louisiana hot sauce (usually made from cayenne chilies) or Tabasco (always made with tabasco chilies), but it's got more flavor. 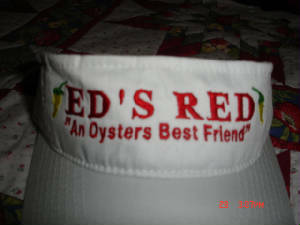 In short, ED'S RED is just perfect for oysters on the half shell. I first encountered the stuff at a quaint eating house called Indian Pass Raw Bar on the back road between Port St. Joe and Apalachicola Florida. Before long it started showing up in supermarkets all over this area. I don't know how far inland the sauce has spread, but anyone interested in it can call Creamer at (850) 229-1937, or e-mail him at ed@edsred.com. 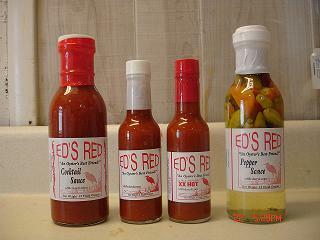 In addition to being an oyster's best friend, ED'S RED also works as a regular hot sauce and as an ingredient in recipes. Being small and easy to pack, a bottle of it is perfect for kicking up canned meats at a shore lunch. ED'S RED puts some wiggle in ordinary Maine sardines, and goes nicely with more exotic fare such as Spanish octopus put up in olive oil, Chinese smoked oysters and even small French frog legs packed side by side in flat tins. A drop or two of ED'S RED will help even vienna sausage! by supplying much needed ZINC! cough syrup is found in hot red pepper! 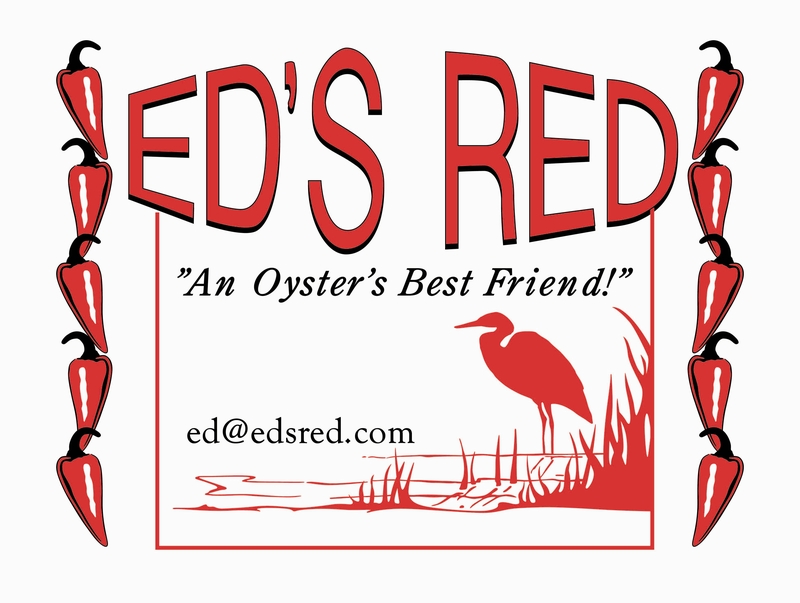 EAT ED'S RED ON OYSTERS! We sell locally made hot sauce (hot and mild) and cocktail sauce. We ship to anywhere in the world! !